Meladerm AHA Exfoliating Serum Review (2018) : Worth Buying? What Is Meladerm AHA Exfoliating Serum? What are the Ingredients in Meladerm AHA Exfoliating Serum? Enhance the appearance of your skin by promoting faster skin turnover but may cause redness. Civant Skin Care offers “Advanced Skin Care Solutions” with product offerings developed with clear R&D backgrounds. Vitamin C: Has natural exfoliation and astringent properties that supports skin renewal, and lightening and brightening of your skin tone.However it causes redness and warm feeling of the skin. Use Meladerm AHA Exfoliating Serum once up to three times every week, depending on how sensitive your skin is and how bad your skin issues that need correcting are. For best results involving skin darkening, both the manufacturer and users recommend pairing this product with the Meladerm Skin Lightening Cream. This product is formulated without endocrine-disrupting parabens. Meladerm AHA exfoliating serum reviews attest to the capability of this product to deliver on its committed results. This product can enhance the appearance of your skin by promoting faster skin turnover but may cause redness on applied area. This product contains several sensitizing ingredients which makes use on sensitive skin types not recommended by the manufacturer. 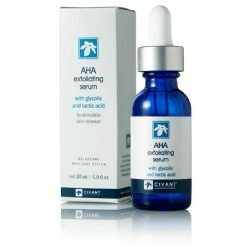 Only 5 (water, glycolic acid, lactic acid, butylene glycol and Vitamin C) out of more than 20 ingredients in the formula are listed before the preservative, phenoxyethanol, which indicates that everything else in this formula are present in very low quantities that can hardly bring about any benefits for your skin. Meladerm AHA exfoliating serum reviews may not serve as good references in understanding better how this product impacts your skin’s health and beauty as these are severely limited, and most of the user reviews available are on the product site. This formula contains Vitamin C which cause warm feeling on skin. Meladerm AHA Exfoliating Serum has glycolic acid and lactic acid to boast of, which, by the way, the manufacturer failed to indicate in what concentrations these ingredients are added into the formula. This product will leave you craving to squeeze more benefits from your US $25 but, still never get it in the end. Many similar products will be multifunctional, offering more benefits that go beyond just deliberately damaging your skin with two alpha hydroxy acids. This product offers return policy.